Archie Andrews the famous freckle-faced comic book icon is meeting his demise in Wednesday’s installment of “Life with Archie” when he intervenes in an assassination attempt on Kevin Keller, Archie Comics’ first openly gay character. 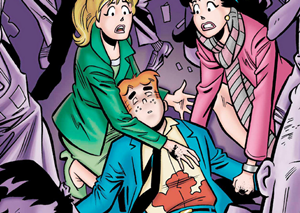 Andrews’ death, which was first announced in April, will mark the conclusion of the series that focuses on grown-up renditions of Andrews and his Riverdale pals. Archie saving a gay, gun-control-pushing senator! The only way this could be any better is it turns out Archie was an illegal immigrant. NOTE: Breitbart.com has just picked up the story.. It’s getting comments faster than you can say “libruls r runing Merica’.